New York, NY – May 2, 2018 – Penguin Young Readers, the Children’s Book Council, and Every Child a Reader are proud to announce that After the Fall (How Humpty Dumpty Got Back Up Again), by Dan Santat (Macmillan Children’s Publishing Group/Roaring Brook Press) is the winner of the Second Annual Anna Dewdney Read Together Award. A book launch and award event for Dan Santat at Vroman’s Bookstore in Pasadena, California at 10 AM on Saturday, May 5 is a cornerstone of events taking place across the U.S. from April 30 to May 6 at 800 schools, libraries and bookstores as part of the 99th annual Children’s Book Week. Dan Santat is the Caldecott Medal–winning and New York Times–bestselling author and illustrator of The Adventures of Beekle: The Unimaginary Friend and the road trip/time travel adventure Are We There Yet? His artwork is also featured in numerous picture books, chapter books, and middle-grade novels, including Dav Pilkey’s Ricky Ricotta series. Dan lives in Southern California with his wife, two kids, and many, many pets. His newest picture book is Dude! by Aaron Reynolds. Santat will be awarded a prize of $1,000 from the Children’s Book Council, and Penguin will purchase and donate 250 copies of After the Fall to a school, library, or literacy organization of his choice. 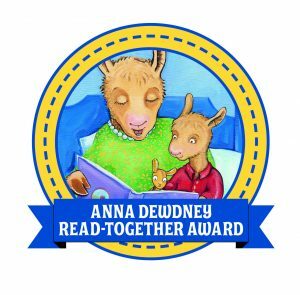 The winner was chosen by voting on a list of five finalists by: Berol Dewdney (Early Childhood Educator, Baltimore, MD; Earl Dizon (a bookseller at Green Bean Books, OR); Mia Wenjen (Pragmatic Mom blogger); Rocco Staino (contributing editor, School Library Journal); Rita Meade (2017 Anna Dewdney Award winner and Brooklyn Public librarian); Christine Pyles (Youth Services Manager, Euclid Public Library, OH); and Lisa Von Drasek (Curator, Kerlan Children’s Literature Research Collections, University of Minnesota). The 2018 Honor Books, selected after a two-month-long nomination process open to the public are: Be a Friend, written and illustrated by Salina Yoon (Bloomsbury USA Children’s); Bunny Slopes, written and illustrated by Claudia Rueda (Chronicle Books); Come With Me, by Holly M. McGhee; illustrated by Pascal Lemâitre (Penguin / G.P. Putnam’s); and Grandmother Thorn, by Katey Howes; illustrated by Rebecca Hahn (Ripple Grove Press). Every Child a Reader is a 501(c)(3) literacy charity dedicated to inspiring a lifelong love of reading in children and teens across America. Every Child a Reader’s major national programs include: Children’s Book Week, celebrating 99 years this April 30-May 6, 2018; the Children’s & Teen Choice Book Awards; Get Caught Reading ; and the National Ambassador for Young People’s Literature program, in partnership with the Library of Congress. The 2018-2019 National Ambassador is Jacqueline Woodson.